The Trade Federation strives to be an open government standing for free trade and basic freedom to operate a business and prosper in a galaxy that gets more complex every day. Through our new citizenship program, we wish to recognize free traders of the galaxy by offering the opportunity of a citizen status to honorable traders. In doing so, the Federation Cabinet has elected to grant citizen status to galactic residents who fit the higher standards set to traders by the Trade Federation. The following information will cover the basics of the program. If you have any questions you are free to contact any members of the Approval Board. Thank you and I hope to see you among us! There are 3 levels of citizenship for the Trade Federation. Each level grants slightly more access to the Trade Federation community. A citizen must have a clean trading record as well as zero association with criminal and/or pirate organizations. Applicants requires basic background check and approval from the Citizenship Approval Board. Also, a level 1 citizen gets a 5% discount on all publically sold product by the Trade Federation. 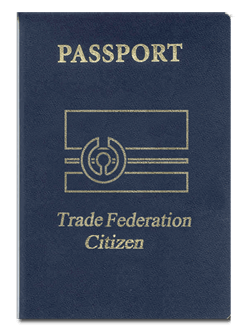 All current and active Trade Federation members are automatically considered level 2 citizens during their tenure. Level 2 citizenship awarded to a non-member sentient is considered a privilege and is only granted to persons who have a long and trustworthy relationship with the Trade Federation. Applicants must pass Level 1 requirements to be considered for Level 2. Applications require approval from the Citizenship Approval Board. - a 10% discount on all publicly sold Trade Federation products. 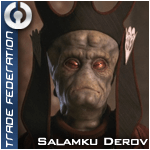 Honorary citizenship level granted only to distinguished persons that have proven over time that they support and live the way of the Trade Federation, and have contributed to the Trade Federation in a way that is recognized publicly. Level 3 citizenship is not open for applications or nominations, only bestowed to recipients by the Trade Federation Cabinet. Honored Citizens get the same product discount and forum/IRC access as Full Citizens. When the approval board reviews applicants, they look at a number of criteria. Keep in mind the goal of this program is to create a vast safe trading community. Where applications might be declined now because of a small or nonexistent trade record can easily be approved at a later date when their experience and reputation are expanded. 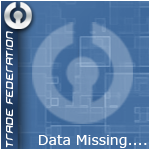 To apply for citizenship of the Trade Federation visit our holonet forums and follow the instructions within.